I thought I would put the year on the title of this post just to give it some search relevance. I don’t know how many posts I’ve seen that are 3–4 years old and while some of the arguments are still relevant others are not. This short series will detail this school’s thinking, surveys, conversations and decisions. This is not an article that is saying one device over another … period! No, that kind of simplistic thinking usually does not benefit schools. Instead we will go through the process of how we evaluate the effectiveness of our devices and what decisions we make based on data and anecdotal observations. Let’s start with some background information. If someone ever asks you what your school uses or what another school should use – get some information first. Fit for a device is important. The school I work for is a small private school that has around 400 students. We are preschool through grade 8 and are broken into 3 divisions. We currently have 1 computer lab with about thirty 21.5″ iMacs. They are older (about 5 years old) but still functioning well despite some expected slow downs. We have three MacBook Air carts for teachers in lower school and middle school to check out. We also have an iPad cart. Each cart has about 22–24 devices respectively. Each lower school classroom has 7 iPads for student use. The classes are about 20 students each, give or take 1–2. The middle school is 1:1 iPads. Depending on the grade level determines which iPad they have. The older the student, the older the iPad. Students keep their iPads through all four years and at the end of the 8th grade we give it to them as their own personal iPad. This is subsidized by a technology fee that families pay each year. That’s the background info. If you have questions put them in the comments below. When I started this position, Chromebooks was a discussion that came up quite frequently. While clearing out an old IT closet the IT team and myself found 2 older but totally working Acer Chromebooks. We spoke with the lower school principal and asked if she thought that this would be a good addition to the third and fourth grade team. We only had two mind you but she agreed. She thought it would be a good way to allow students to try them out and to get some authentic feedback. That was back in September of 2017. The third grade team didn’t really use it too much for whatever reason. The fourth grade team reported back that students choose the Chromebook first before an iPad. I pressed them for a reason and they had not inquired. Their thoughts was that they do a lot of work in Google Docs and the addition of a keyboard and trackpad makes working in that environment much easier than a touch screen. Also during budget time (October-November) the lower school principal asked if we could have 20 Chromebooks for the third and fourth grade classes. When I asked why she said it gives the students choices and increase more technology opportunities for more students. If a student wants to record video, than the iPad is the clear choice. If a person wants to type a report, then the Chromebook is the clear choice. These choices give the class flexibility and having more devices can allow more opportunities for these students. We had room in the budget and so it was added. These classrooms will not be relinquishing their iPads, the Chromebooks will be added to their classroom’s technology offerings. As I mentioned earlier, this has been a question. In fact the division head in middle school wanted to evaluate the program itself. Well myself and another teacher put together a short survey and I’ll share some of the results with you. Keep in mind we are a small school and we only have 17 total respondents for the survey. Here are the questions for each (I would embed the form but WordPress.com will not allow it). When the question references a scale – 1 is the worse and 4 is the best. On a scale of 1–4 – Do you feel the 1:1 program is effective? (Optional) – Can you give an example that supports your answer above? On a scale of 1–4 – Does students having a device enhance the teaching and learning process? On a scale of 1–4 – Do you think the iPad is the most effective device for our middle school students? (Optional) – Can you give an example that further explains your answer above? On a scale of 1–4 – Does the iPad do everything you need it to do? Can you give examples that support your answer above? How often do your students use the iPad in your class for educational purposes? On a scale of 1–4 – Do you feel that it is easy to plan lessons that utilize the iPad? How do you and/or your students utilize the iPad in your class? On a scale of 1–4 – How familiar are you with Chromebooks? On a scale of 1–4 – Do you think Chromebooks would be a more effective device than an iPad for our middle school students? Please explain your answer above with some details. 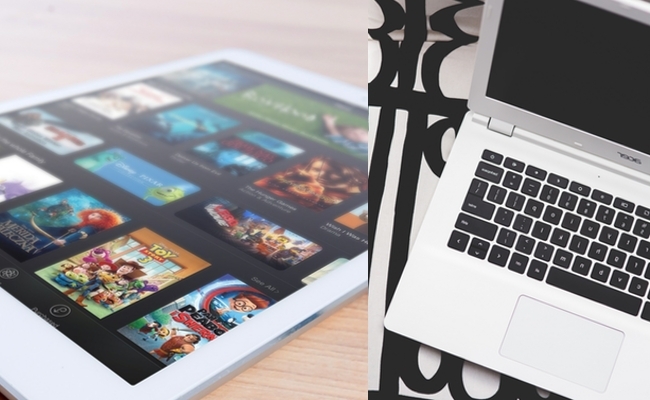 Yes/No – Do you know of any Chromebook Apps that you and/or your students could use in your class? (Optional question) – If you know of these apps or extensions could you please list them below? Again, no need for a description just their name. 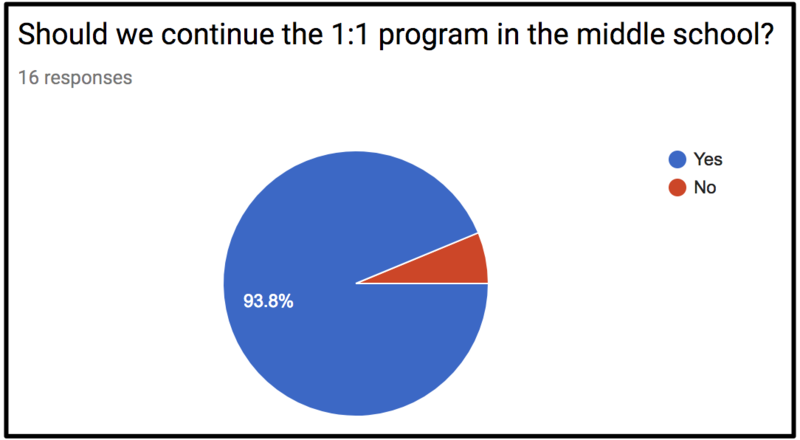 Yes/No – Should we continue the 1:1 program in the middle school? What device would be best for the 1:1 program? (Optional question) – Is there anything else that you would like to share or have an issue or concerning the 1:1 program? So that’s the survey and as you can see some of the questions give teachers time to write out some of their responses. I will share a few of them but I will share all the results from the quantitative questions in graph form. 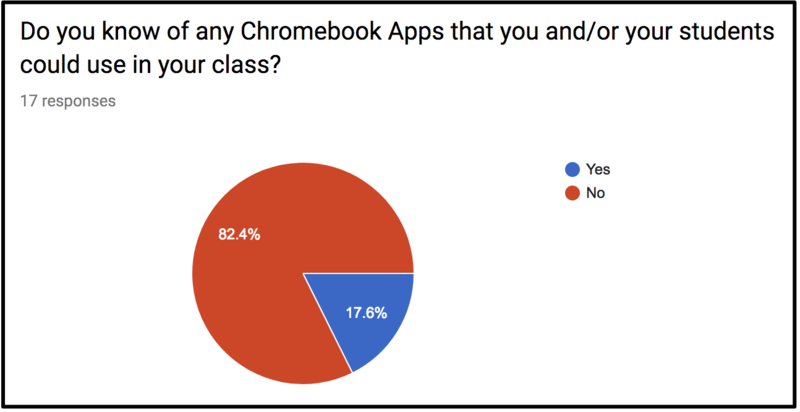 From the data it looks like Chromebooks are the clear winner here. However it is not so black and white. 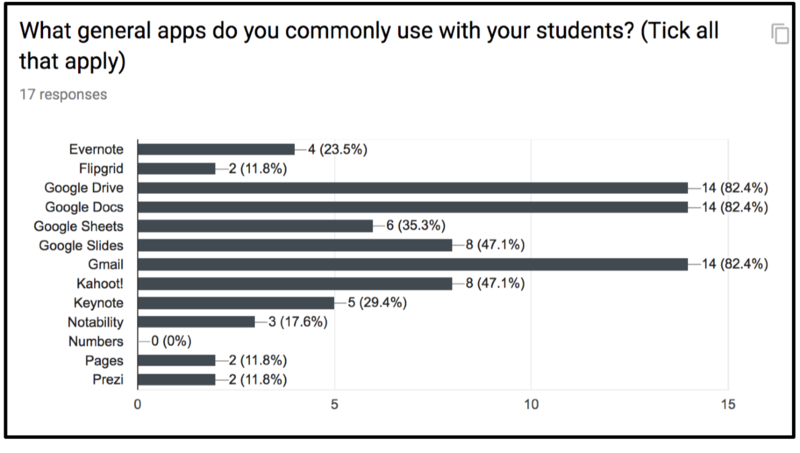 When going through the written responses it is quite clear that there are some specific apps and some specific ways that teachers use the iPads in their classrooms that show that they may not be so ready to jump into Chromebooks. I was forced to choose yes or no, but without more information on the benefits and disadvantages of other options it is really difficult to make an informed answer. It doesn’t type well. It’s invaluable for my Tempest unit, where I teach using the Tempest app on their i-pad. That IS the text for that unit. There are other responses that ring similar to the ones above, so while I feel the middle school staff is leaning towards Chromebooks more conversations with the staff, parents and students as well. More reporting will come soon! This entry was posted in chromebook, iPad, Patrick Cauley. Bookmark the permalink.